This comprehensive article on how to read music will be particularly focused on guitarists wanting to learn to read music and will cover the basics of reading music. Let’s start with the notes on the staff. When looking at sheet music the staff is where all of your notes will be located. The staff is made up of 5 lines – a note placed on each of those lines or in the spaces between those lines represents a different note. Which notes those lines represent depends on whether we you are playing on a treble clef or a bass clef. 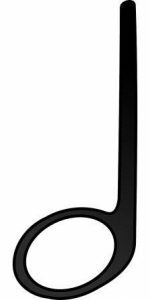 Bassier instruments use the bass clef and higher sounding instruments use the treble clef. As a guitarist this distinction isn’t too important as you will always be using the treble clef. 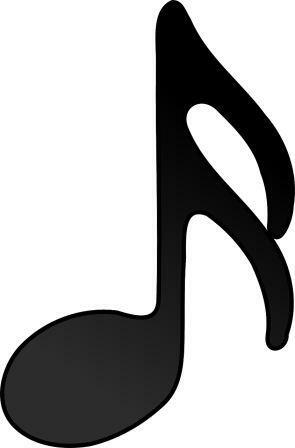 The treble clef looks like a fancy letter G, kind of. 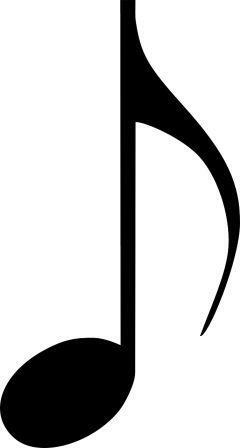 When this fancy G shows up at the start of the staff it indicates that you are playing on the treble clef. O.k. so let’s look back on the staff. There are 5 lines and each of those lines and the spaces between those lines represent notes. On the treble clef (which is what guitarists will use) the notes are as follows. So the lines from the bottom are E, G, B, D, F.
There are a few different ones for this but this is the one that I remembered the most. As long as you remember it, it doesn’t matter what you use. Cool, ok so now let’s take a look at the spaces in between the lines. So, the notes between the lines are F, A, C & E.
I find the easiest way to remember this is simply that they spell the word FACE. This might all sound a bit confusing at first if you are completely new to reading music but also remember that these notes are also in alphabetical order. You might be wondering where on the guitar these notes are. So let’s take a look, one note at a time, starting with the notes on the lines. Now you might be wondering of course where the other notes on the guitar fit in. Starting with the spaces directly above and below the staff. The open D string (4th string) is notated just under the bottom line (again remember that it’s all alphabetical. The 3rd fret e string (1st string) is notated just above the top line – i.e. this note is a G and is notated one space above the F (which is the note of the top line). What about notes higher and lower than those? For anything that is higher or lower than those notes we simply add in a small line. The line won’t go across the entire staff like the main lines – it will be just wide enough for the note to go onto or under. For example the C note (played on the 3rd fret of the A string) will be placed on a line just under the staff. And finally the E note (open E string) will sit just under that 3rd line. The same goes for the higher notes. Playing an A on the high e string (5th fret e string) the note would sit on a line created just above the staff. And so on as you get higher and higher notes. Play around with the notes on the guitar and where they would be located on the staff. The best way to become familiar with this is to play the notes. To represent a sharp or flat we could just add a flat symbol or sharp symbol next to the note to indicate what that note should be. The notes above are an F sharp and a G flat (the same note) – which would be played on the 4th fret of the D string (4th string). This is one way to do it but music has a more clever way to do this. Key signatures are a way of telling the musician which “key” they are in. For example you might be in the key of C major. In this case the notes of that key would be the notes of the C major scale. For the key of C major there are no flats or sharps so this is easy. But what about if you are in the key of A major for example. A major has 3 sharps. Instead of writing those notes as sharps every time, the key signature is notated at the beginning of the staff. So using A major as an example instead of writing out the scale with the sharps in it we add the sharps at the start of the staff like so. How come some music still shows sharps and flats? Of course there may be times when a piece of music throws in a note or two outside of the scale and in this case you would simply write the sharp or flat symbol to notate that. Or sometimes you will need to put in a natural symbol. 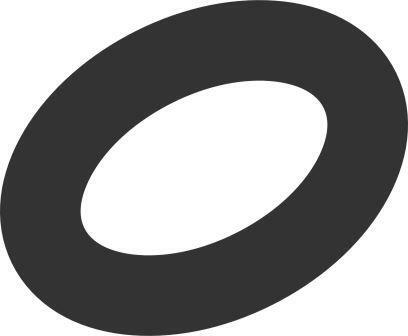 So to represent a C we would add a natural symbol to the note. In the diagram above the first note would be a C# and the note with the natural symbol would become a C.
If the key signature has sharps or flats these sharps or flats are always shown in a particular order on the staff. For example if you are in the key of C minor then you would have 3 flats. The B flat is shown first, then the E flat and then the A flat. The flats are listed in the following order. This makes sense because the keys with one sharp are G major and E minor. These keys have an F# (the first on the list). The keys with two sharps have F# and C# (D Major and B minor). And so on. The same goes for the flats. The F Major and D Minor both have just one flat and that flat is Bb. The keys with 2 flats have Bb and Eb (Bb Major and G Minor). That was probably a lot of information to take in if you are new to this stuff. It’s o.k. if you don’t get it at first it takes a bit of understanding to begin with. I encourage you to play the notes on your guitar to become more familiar with them and how it works. Write out a simple staff with a key signature and the scale of that key signature. For example you could start with A major. Write out the scale using the key signature as shown above and play the notes on the guitar making sure you are actually playing the A major scale – and read the music as you do it. Why Learn How to Read Music When there’s Tab? There are a couple of limitations to tab. One of those is that it doesn’t notate rhythm. The notes are all there and it’s an easy way to tell you where to play those notes on the guitar but you have no idea of the timing of those notes without listening to the music. And even if you are listening to the music it’s often easier, more accurate and faster to learn having the rhythm written out. So how does sheet music notate rhythm? Each note that you play has a time value. That note sounds for a certain length of time. In sheet music, the length of every note is notated. The first thing we will look at to make this easier to understand is bars. Sheet music is broken down into bars. Bars are represented by a vertical line going through the staff. Every bar has a certain number of beats. How many beats the bar has depends on the time signature. For example if we playing in 4:4 time (which is the most common, especially in popular music) then there are 4 beats in the bar. In particular there are 4 quarter notes in the bar. We will be focusing on 4:4 time to explain things here as it is the most common and easiest to understand. Now let’s take a look at the different note values. I will try to use both the terms for music here. These are known by different names depending on where you are from. American music uses the terms whole note, half note etc. Whereas the British terms are semibreve, minim etc. I prefer the American terms because the names of the notes explain what they are better. But if you are outside of America you may need to know the other terms so I have included them for completeness. O.k. now let’s take a look at each note and how much time they represent. We will be looking at this from the perspective of 4:4 time because it is the easiest way to look at it. The whole note lasts 4 beats in 4:4 time. In other words it lasts the whole bar in 4:4 time. So if you were to play this note then you would play the second fret G string and hold the note for 4 beats. Tap your feet in a steady rhythm. Every 4 taps of your foot is bar. The whole note will last for 4 taps of your foot. Naturally a half note will last for half as long as the whole note. Makes sense right! This is why I like the American system. So now imagine tapping your foot the note will play for 2 taps of your foot. After two taps you play the note again and that will last for another 2 taps. The quarter note represents 1 beat in 4:4 time. So there are 4 quarter notes in a bar. This last for half the length of the half note and for a quarter of the length of a whole note. Now when you are tapping your foot (or listening to a metronome) the note will last 1 tap of the foot. In the measure above you will play 4 A notes in the same time as you played 1 A note when you played the whole note earlier. 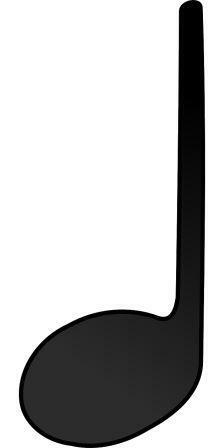 An eighth note lasts for half as long as a quarter note – for an eighth the time of a whole note. There are 8 eighth notes in a bar. When you are tapping your foot now there are 2 notes for every 1 tap of the foot. 4:4 time is just one time signature but thankfully the length of the notes remains constant. So if you have 3:4 time for example, then there are 3 quarter notes in a bar instead of 4 quarter notes in the bar. The quarter notes still last for the same amount of time as they would in 4:4 time. Now we’ll look at some different time signatures and how they work. To recap what we learned previously. Sheet music is separated into bars. Each bar has a certain number of beats in it. 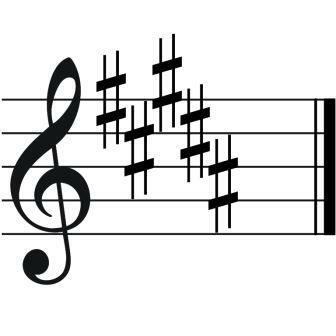 In 4:4 time each bar has 4 quarter notes (crotchets). In 4:4 time each beat is the equivalent of 1 quarter note and there are 4 beats per bar (i.e. 4 quarter notes). However 4:4 is the not the only time signature. There a variety of other time signatures that you will need to understand if you plan on being able to read music – and often even just to play along with others, understanding of time signatures is important. And if you are writing music it’s also very beneficial to understand how time signatures work. The first 4 in 4:4 time refers to the number of beats in the bar. The second 4 in 4:4 time refers to the fact that the bars are measured in quarter (1/4) notes. Time signatures measured with quarter notes are sometimes known as quarter-note time. 3:4 time is also a quarter note time – the 4 after the “:” (the bottom number on the staff) represents that the time signature is measured in quarter notes. 1 quarter note in 3:4 time = 1 beat. In 3:4 time there are 3 beats in the bar. So there are 3 quarter (1/4) notes. Not all time signatures are in “quarter note time”. 6:8 time is measured in “eight notes” (quavers). In 6:8 time there are 6 eighth (1/8) notes per bar. 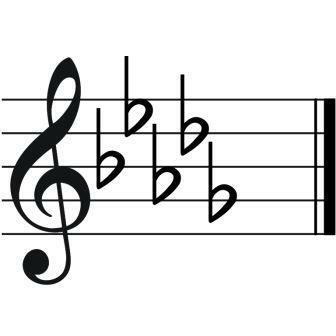 There are 6 beats per bar but those beats are eight notes instead of quarter notes. 3:2 time is measure is measured in half notes (minims). So each beat lasts the length of a half note. In 3:2 time there are 3 half (1/2) notes per bar or 3 beats per bar. The above are just examples of a few different time signatures, although some are more common than others like 4:4, 3:4 and 6:8. O.k. that’s all very well but how do we know how long each note actually lasts for. I mean, how long does a quarter (crotchet) note actually last for? That’s where tempos come in. We’ve now learned about time signatures. Now we’ll take a look at the speed of music or more specifically music tempo definitions. It’s all very well to know the time signature so that we know that there are 4 quarter notes per bar in 4:4 time – but how do we know how long those notes are going to last. Or in general how fast we should be playing. 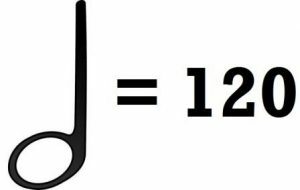 Realistically we are not going to look at a tempo that says 120BPM and be able to get that bang on without a metronome but as you learn about reading music and looking at tempos you will gain a feel for roughly how fast each tempo is. Also, if you do have a metronome you can set it to the right tempo for an accurate speed. This is particularly useful for recording. These days there is usually a corresponding BPM (beats per minute) for each tempo. 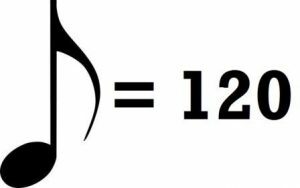 This essentially means that each quarter note will last 0.5 seconds and so there will be 120 of them in one minute. If you were to have a tempo of 60BPM then each quarter note would last for 1 second and there’d be 60 of them in the minute. 60BPM would be twice as slow as 120BPM. In 6:8 time, for example, then the time would be notated for how long the eighth note would last. 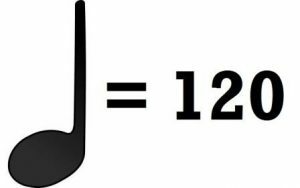 For example “eighth note” = 120BPM would mean that there would be 120 eighth notes per minute – each eighth note would last 0.5 seconds. This would be quite a slow pace – it would be the equivalent of 60 quarter notes per minute. If the time signature was in 3:2, then it would be the half note that would be the tempo measure. In this example there would be 120 half notes per minute. Each half note would last 0.5 seconds. This would be a very fast tempo and would be the equivalent of 240 quarter notes per minute. Not all tempos are notated in BPM. Tempo may be indicated by one of the following Italian words. I have also shown the approximate beats per minute for each. The beats per minute shown represent quarter note time. So each BPM below is how many quarter notes per minute roughly speaking. I hope this lesson has helped you to learn how to read guitar sheet music. There are some other factors here but this is the basics. If there is anything you think needs adding to this then feel free to leave a comment in the comments section below.